As you read this blog you see we got “questions”… but “answers” are decidedly few… or are they? Is your Pastor (Elder) qualified according to Holy Scripture ? Does “Pastor” Edward A. Jones of Faith Assembly of God in Poughkeepsie, NY have the Biblical qualifications to hold the Office of Elder (Pastor)? For those who wonder what the heck I am referring to, this is a quest for answers from “Christian Leadership” at Faith Assembly of God in Poughkeepsie, NY. It is seeking the answers over immoral, unethical unbiblical actions against a cripple, his family, and innocent peaceful folk. It is about being thrown out in an unbiblical “exile”. It is about protecting unrepentant criminal activity while avoiding sound doctrine in dealing with the criminal activity. It is about others who have been exiled in a similar manner. Those who have read this blog know well what is being spoken of. It is about sin heaped on top of sin. Yes, the focus we have is on Doctor Brother Pastor Edward A. Jones of Faith Assembly of God in Poughkeepsie, NY and his two-tier system of control where hirelings and underlings service the bidding of Pastor Jones instead of the risen Savior they claim to serve. As you see, I have questions. As Christians, it is part of our DNA. We were installed with a yearning for the Truth as we came to Christ. It was in many of our cases installed in order to come to Christ. Let us continue on that thought. We would not have come to faith without that yearning. We were in rebellion against Yahweh. We did not choose Him. He chose us. We couldn’t choose him, we were dead in our sins. He chooses us. He convicted us of our sins. We were in rebellion. He let us see our depraved state and chose Life for us. Yahweh made that decision to adopt us. We did not have any righteousness to choose Him. The only righteousness we have is by Him through Christ. That “Truth” and all truth is through Christ. Not any man. Only through Jesus. If you don’t have the truth there is no Love. Without “Truth” the love we say we have is no “Love” at all. If we claim to have love without the truth; we have neither and we are not of God. So, is truth a guiding force in the Christian’s walk with Christ? Are we going to accept a doctrine without Scriptural truth? Do we trust elders (pastors) and deacons that cannot (or won’t) explain their actions that are not anchored in that same scriptural truth? Do we willfully blind ourselves to God’s truth, because the truth is uncomfortable or gets in the way of our narrative? So, you think we don’t have the answers, but we do. We don’t have the answers from those whom the question was asked. But we do have the answers using scripture, especially knowing what the Lord expects for those who claim what they are or the office they occupy. In other words, we in the visible church have clear “Reasonable Expectations” of what God tells us in his Holy Word He expects of us all and what we are to Him. The mere fact that no leader encountered can open a text that explains these actions Biblically says volumes. In those scriptures, we have instructions and qualifications of leaders. The Bible also tells us about what to look for in false leaders (wolves and hirelings). All of it is throughout the Epistles and the Gospel account which is also shadowed in books like Jeremiah, Ezekiel and Isaiah and throughout the Hebrew Bible. We can “reasonably” know by now that any response from Pastor Edward Jones and other leaders involved and challenged that any answers we get now have the very high probability of being tainted unless there is a conviction that leads to open repentance for the forgiveness of sins. But we in live in a world where the visible church believes repentance is a dirty word. 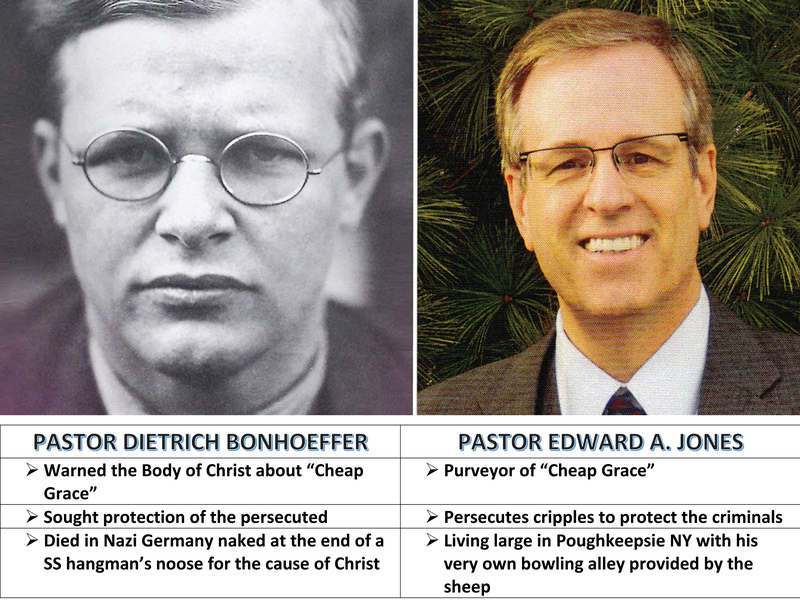 As Bonhoeffer had warned the Body about, it is the church of Cheap Grace. So, with that said, I believe we can safely and sadly say that the non-credentialed leaders of Faith Assembly of God for various reasons that are not Biblical, ethical or moral will not challenge Pastor Edward A. Jones for outright sin. They cannot even answer for what they have done and/or said. Even if they wanted to. Not one will answer to God, so they won’t answer to man they see on that created unbiblical “lower tier” that they themselves created. It’s beneath them. The Biblical model of a “servant leader” has been run over by the Faith Assembly bus in the name of efficiency and man’s creativity. The concept of “The Priesthood of ALL Believers” was thrown under the same bus to protect sin of a “false” upper tier who has created a special dispensation for sin much like the Roman church created special dispensation to commit murder in advance of the sin. We know that Pastor Edward Jones is willing to spend the congregation’s money for John Morabito to write a christianeeze attack letter on church time via the church’s email system. Ed Jones sees no need in correcting sin of the top tier leadership or answering for their sin that Ed Jones used to pay using the congregation’s money. We simply know this by Pastor Jones’ silence when his fiduciary responsibilities require him to answer for this. Pastor Jones by ignoring that work; and that is in practice as if EJ wrote it in his own hand. So, what is the question now? And the answer is “No”. I know most of you at Faith Assembly of God don’t like the question. And you don’t like the answer. And yes, I understand the emotional reaction. But you can’t answer the question any other way than without emotion. That is quite evident with the exchange by Brother Ernie Martone who would not even defend his insidious but mysterious lie. It certainly wasn’t evident in John Morabito’s Christianeeze response to this blog who rather blatantly ignored the unrepentant sin of leadership without a speck of concern about innocent folk. But neither of these cowardly brothers would or could give a Biblical argument. Which leads to the next point which is they depend on one leader for their information to make a decision. They can’t make an argument for their position because in part they are superficially shallow in their doctrine. They create their doctrine by the spewing of a Guru which allows them to create their own – not Yeshua’s Doctrine. Who is their Father? What “god” have they created for themselves? Again, they have forgotten what Jesus said or they were never taught what He meant. The former is the most likely. In the ten years before exile we never heard of a breakdown on what Biblical leadership is to look like at Faith Assembly of God in Poughkeepsie. And this is the setup for the perfect storm. A congregation that is ignorant and knows not the standards to hold accountable are lambs being set up for slaughter. A lower level leadership that can’t correct one another nor the pastor. Which means they have not the Biblical knowledge to even correct the sheep. It is the perfect set-up for abuse of the sheep. It is the perfect climate for heretical doctrine to spread. Biblical illiteracy is the “Perfect Storm” for a church to go cult. It is the perfect platform for the “world” to enter in and for narcissism to flourish with all the camouflage of polite smiles perfected phony christianeeze dialects which are all protected by a very comfortable “Wall of Unaccountability” that was erected by the likes of Edward Jones himself. It is the “Perfect Storm” as described in 2nd Peter, Jude, and the epistles written by John and Paul. It is what our savior Yeshua told us would happen in the Olivet Discourse. Our greatest enemy against the church is within. It is not coming from the outside depraved world. It is not the sheep. The Holy Scripture is abundantly clear, the division is from false leadership. NOTE ASIDE: If you are among those sheep who have accepted a place of ignorance then you are in trouble. It is time you study as a Berean. It is not an excuse to say you never heard it from the pulpit. Pray for discernment and the Lord will give it to you. In the upcoming weeks, we will post some scholarly work on Biblical Leadership. Come with an open Bible. Hopefully it will be a good place to start. Remember your walk with the Lord is directly connected in finding out the character of the Lord and His doctrine, not ours. Again, we come full circle. We ask the question again. 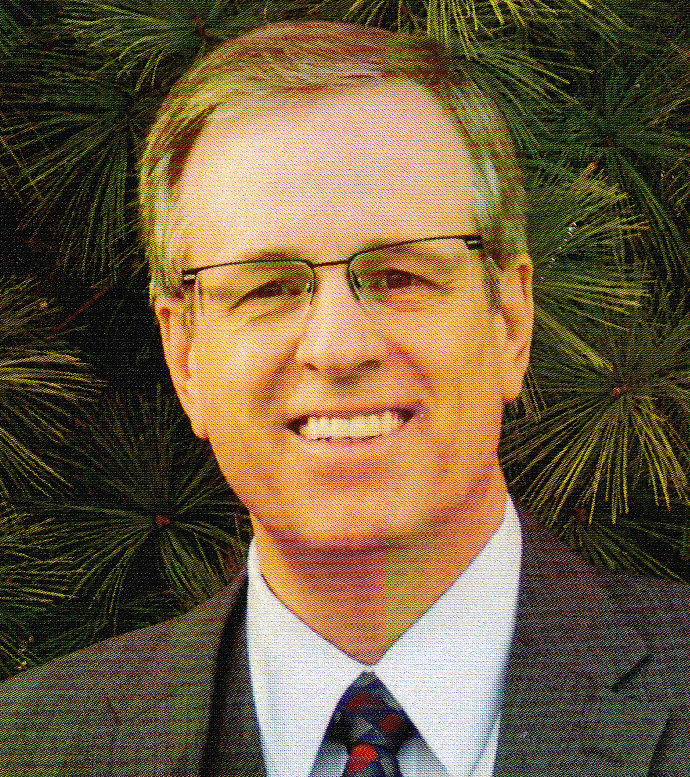 Is Edward A. Jones fit and qualified for the office of Elder (Pastor). And the perfect storm has also run full circle because the sheep have not been equipped and act not out of reason but out of emotion and particularly pride. And at any time one of the learned ones that hand the title of “pastor” could have answered these questions with an open Bible if what happened here is the sign of a qualified leader. The fact is that no Assembly of God Pastor will answer this question. Not one will put their name to an answer that would be publicly scrutinized whether it would be nay or yay. We know that Ed Jones won’t. We know Dave Bienemann won’t. We know that John Ogden won’t. We know that Linda Schreck won’t. After all they are complacent. They all have their hands still stained with the sin of two impenitent criminals by the name of Constance Ramsey-Dixon and Carrie (Caridad) Cocurullo who crippled a brother and Church leadership went to extraordinary extremes to protect them while putting cruel burdens on the cripple and his family. All which led to Church leadership go to more extremes to include leaks, exchanged information between those two criminals and Pastor Schreck without the victim’s consent, knowledge and refusal of explanation when found out about this exchange of personal information to the people who cripple me. Then came the secret tribunals and the board leaked information that found its way to other churches. By the way that was done long before this blog. And yet “Pastor” Edward Jones has accepted never and responsibility to include informing me of what was leaked or the potentially leaked from EJ’s illegal secret tribunal. Point of information: Leaders who I addressed these leaks to, did not inform the rest of the board. This is serious. It is assault on common decency and core of principles of confidentiality. It is corruption. It is malfeasance, contempt for fiduciary duties and a basis for removal. And foremost it is sin against Yahweh. A junior NCO in the US Army has a much higher regard for the troops (sheep’s) personal confidentiality (as in most institutions) than the “leader” at Faith Assembly of God. As I have been informed by an outside when leaks happen like this, if the responsible leaders cannot be found, the first priority is to do everything possible to relieve or stop any negative effects on the target (me) from the church’s unethical and unbiblical release of personal information to include public announcement asking for forgiveness to the victim or target, provide the target privately with all possible information that could have been leaked and be willing to go the extra mile to explain publicly to negate or minimize any negative responses from such a leak. Am I right? That is in line with having an “penitent” faith in Christ. That is called the fruit of repentance. To any Assembly of God credentialed Pastor; isn’t that the model for what is supposed to happen? To any Assemblies of God “credentialed” Pastor that can say that activity is reflective of someone who is qualified for the office of Elder (Pastor) feel free to open your Bible and show me. If you read this Blog thoroughly, you know I requested through leadership that The NY Superintendent of the Assembly of God be notified in writing. Their reaction was to leak personal information and not forward my request to Pastor/Superintendent Duane Durst. Pastor Jones has yet to give me an explanation. Does this sound like someone who holds the qualifications of Pastor? Or was that a cripple’s punishment for not enduring very well documented slander, stalking and extortion from two “protected class” impenitent criminals? And while you, “the credentialed” pastor within the Assembly of God, please tell me where in the Bible do you exile a congregant. I purposefully use the word “Exile”, because the disfellowship really started within a day of the Criminal assault by Cocurullo and Ramsey-Dixon which is a natural effect of that cruel gag order. And then led to a full-blown exile. The exile started then to protect criminal behavior the it exploded to protect the obscene, cruel, and evil behavior of leadership. You can’t tell me this is ANY model of church discipline. If you do believe that; you would put in question “your” qualifications to be a “credentialed” pastor within the Assemblies of God. It would even put into question whether you could hold the office of Deacon. You have to apologize to Jehovah Witnesses if you demean what happened and call it disfellowship, because at least they at least, albeit in a twisted manner, the JWs will tell you to your face AND put it in writing what the “Charge” and what constitutes as repentance to be joined back into fellowship. Pastors who avoid this are cowards and dishonor their office. It dishonors Yahweh. It tells us that “Pastor” Edward A. Jones doesn’t just have contempt for the Constitution and Bylaws of Faith Assembly of God, but Holy Scripture. It is not just sin against the exiles and the congregation; it is ultimately sin against Yahweh. EJ has no fear of Yahweh. EJ remains impenitent. EJ believes he has special dispensation from repentance. EJ has created himself as an idol. Again, if you, “the credentialed” pastor within the Assemblies of God, can sit down with an open Bible and explain to this wretch of wretches that I am wrong, please try explain this “apparent” dispensation to sin against the most vulnerable. At what cost was this self-imposed/granted “Cheap Grace” for himself and his abusers. Tell me that “pastor” Edward A. Jones has the qualifications for the Office of Elder (Pastor). Explain to me that EJ is not only a “coward”, but a thief also. He is taking money fraudulently from “members” under the guise that they will be treated Biblically and according to that Constitution and Bylaws. The First Epistle of Peter Chapter 5 means nothing to “Pastor” Ed Jones and his inner circle subordinate “leaders”. To “the credentialed” pastor within the Assembly of God who may feel compelled to answer: How much authority of one in the office of Pastor wield before they walk over that line of “Lording over” you? Let me narrowly define that question in just one aspect given to a man with a twisted spine, various injuries so great that he couldn’t sleep who was given an ultimatum called a gag order in two phases. A gag order that wanted me to lie to my family and my employer. A gag order that stopped me from pleading for help from the brethren. A gag order that was not given to the criminals Carrie Cocurullo and Constance Ramsey-Dixon (who didn’t have a twisted spine and not at risk of losing their livelihood). I just want to go to phase One of the gag order; a veiled threat not to go to the police after “criminal trespassing” and “hit and run”. The leader in the church is to shepherd as a servant, they lead by example and not driven by compulsion. No Pastor has the right to use his office to go exercise authority beyond the scope of what God has given them. They dishonor the Office when they do it. They dishonor Yahweh first. A veiled threat is a particularly ominous threat, because it suggests a greater threat than what the person giving the threat is willing to say. This threat that was witnessed by my neighbor given to me by the stalker Cocurullo through Pastor Linda Schreck. It was taken as a “Legal” threat. My neighbor agreed and felt I suddenly needed legal advice. After all that I was worried about, now it appeared I had to see a lawyer for which I did. Fortunately, the whole episode was recorded and the lawyer put my mind at rest. To this date Pastor Linda Schreck (Underling of Pastor Jones) and “Pastor” Edward A. Jones refuses to explain their authority to give such a threat. Both have refuse to state the nature of this threat. Where is it in the Bible that this is in a Pastor’s job title. Where is the transparency for the victims? This is malfeasance. It should be noted that this is a very very small issue when it came to the Gag Order. This ungodly and cultic Gag Order is such a large subject. I couldn’t even scratch the surface and won’t attempt to. If, you, the credentialed” pastor within the Assemblies of God, would like a taste of what went through read the whole blog. It would take a book to come close to the dangers that one goes through because of this ungodly act. It is a direct assault on the Doctrine of all believers and an Elder (Pastor) or Deacon who engages in this or supports this; they should be removed from office immediately. Then and only then with an uncompromised restoration plan of repentance with restitution to all he or she damaged before restoration can enacted, if indeed restoration is possible. I challenge you, the “credentialed” pastor within the Assembly of God to correct me biblically. All this was to protect criminal behavior at the expense of the innocent. It again is sin heaped upon sin while we build a “god” of our own making. It is the age of Cheap Grace with a high cost to those who Love God. It is even a higher cost for those who now believe they are those “gods” of which they made themselves. In Act 20, Paul upon his farewell to Ephesus reminds the Elders it is Christ’s church and that God paid with his blood. He charges them to protect the flock and themselves because savage wolves will come among them and will not spare the flock. Well, guess what: It isn’t EJ’s church, it is Christ’s. And the wolves are among us and setting up shop. If you, an Assemblies of God “credentialed” Pastor is willing to address directly without false argumentation such as Mr. Morabito and leave your name which can be validated, I would be interested. As you read this blog you see we got “questions”… but “answers” are decidedly few… or are they? This blog remains a standing indictment. That is the conclusion for this post. I thank you for reading. This post is basically introduction on the series coming ahead on the qualifications of Pastor and the effects of modern day heresy upon that office of Pastor. It will not be me communicating to you, but good Biblical Protestant Pastors and Theologians. It will be a series and start next month. The series will be called “Is your Pastor qualified”. It will be our effort to fight Biblical Illiteracy among the Brethren as it is worse than any time since the reformation. It is my humble prayer we all renew our Faith in God with the fruit of repentance. This entry was posted in Church Corruption, spiritual abuse and tagged Church discipline, Duane Durst, Faith Assembly of God Poughkeepsie, False Teachers, NY State Assemblies of God, Pastor Edward Jones, Poughkeepsie.